Trenton Area Soup Kitchen (TASK) - Times Publishing Newspapers, Inc. The Trenton Area Soup Kitchen (TASK) has been providing food, hope and opportunity to people in the central New Jersey area for 36 years. It is open every weekday. TASK’s mission is to feed those who are hungry and offer programs to encourage self-sufficiency and improve the quality of life of its patrons. A corps of 4,000 volunteers helps TASK serve thousands of meals a week at lunch Monday–Friday and dinner Monday–Thursday, at its home on Escher Street, in Trenton. 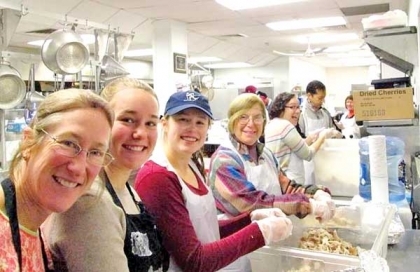 TASK makes and delivers thousands more meals to 14 satellite soup kitchens in Princeton, Hightstown, Yardville, Trenton, Bordentown and Hamilton. To make sure area children enrolled in the Free and Reduced School Breakfast and Lunch programs have food to eat over the weekend, TASK partners with Mercer Street Friends and 24 local schools to deliver weekly meal packs to nearly 1100 area students. Last year, TASK provided more than 350,000 meals – 21% more than the year before. Service is free and unconditional and the need is still growing. But relieving hunger is only the first step. Before mealtimes, the TASK dining room is transformed into an adult education study center where 70 tutors work individually with students who want to reach their personal goals and/or get their diploma. They can also work with a job-search specialist, take computer classes and participate in field trips. TASK gives out essential basics donated to the soup kitchen, such as personal hygiene kits, coats, socks, reading glasses and books. There are holiday celebrations, haircuts and photo portraits, too. The TASK case manager assists dozens of patrons every week to obtain IDs, find housing and connect with the nonprofit services they need. And to encourage talent and restore confidence and self-esteem among the people who come to TASK, the soup kitchen offers weekly music, visual and performing arts programs. TASK relies on its loyal donors and amazing volunteers, who come from near and far and give 20,000 hours of their time each year. For its work and transparency, TASK is proud to have been awarded Charity Navigator’s perfect 4-star, 100% rating – the only charity in New Jersey to be so honored. Join TASK’s mission! If you are hungry, come for a meal. If you’d like to volunteer and/or donate, give them a call! Find more information at TrentonSoupKitchen.org or contact TASK at 609-695-5456 in NJ or jsteinhauer@TrentonSoupKitchen.org.